My major in university was history. I love history, but I have dozed off at many a dry and boring lesson and I have sat through many university history lectures. However, I did have a few professors who understood that history is not boring and should not be presented as a list of dates and events. There were people involved, people who were creative and interesting enough to be documented and shared with the future. 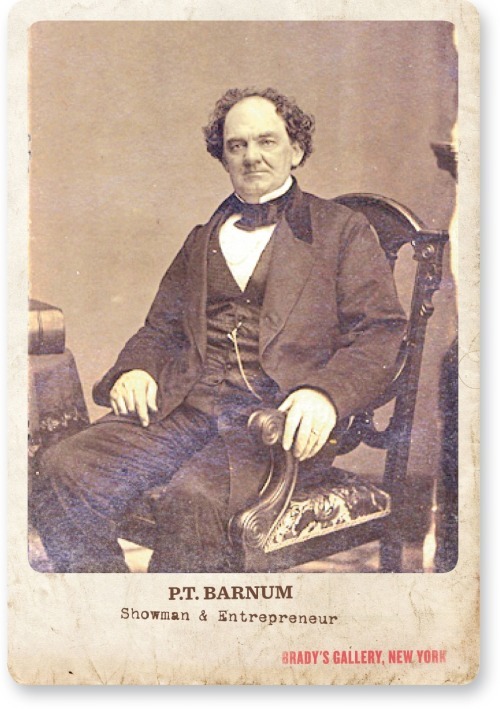 Professor Jillian Lerner (the author) and Marc Olivent (the illustrator) understand this idea and have done an admirable job of bringing history to life in The Peerless Prodigies of P. T. Barnum. Not only that, but they have used a little fictional license to entice a younger crowd. They have also taken a piece of history and made art of it. Their graphic novel is one of the most entertaining history books I have read. It draws the reader in with the story and the great artwork. It reminded me of the old “Believe it or Not” illustrations. Now mind you their topic is intriguing to begin with – advertising in the 19th century. With all of the new technologies being invented in the Victorian period, and the Victorian hunger for the strange and bizarre, the field of advertising was growing and changing quickly to feed this hunger. While their graphic novel is a mix of the historical and fantastical, the reader can find out more about the historical figures by simply going to their website prodigies.ca They have done a great job of giving a history lesson on the main characters, again in an entertaining fashion, that will surely stick with the reader. I bet if we had more of these types of history books in our schools there would be a lot more people interested in history. You could also use these for other subjects generally thought of as dry....like geography. How about a series of graphic novels taking Captain Nemo to different parts of the world while teaching about that part of the world. Ok, I'm getting a little excited. You get the idea. Thank you Dr. Lerner and Mr. Olivent for making history interesting and fun! I completely agree with your comments about this incredibly interesting work. Historically accurate, intriguing, fun ... I loved it. I can't wait for the next book! !